Long before drones and GoPro cameras gave us aerial views of the globe, birds of prey combed miles of desert in search of food for the nomadic Bedouin people. Once a sport exclusively for kings and aristocracy, falconry literally meant life or death for Bedouins of the Middle Eastern deserts. As hunters, this meant whether the tribe ate that night or not. 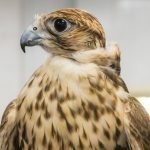 Today, falcons and peregrines “retired” from hunting, are prized and revered pets in the United Arab Emirates.